The production area of Salama da Sugo PGI is within the territory of the Province of Ferrara, with the exclusion of the municipalities of Codigoro, Lagosanto and Comacchio, in the Emilia-Romagna region. The origins of Salama da Sugo date back to the Renaissance and can be linked to the court of the Dukes of Este, rulers of Ferrara from the XII to the XVII century. In Banchetti, composizioni di vivande e apparecchio generale, written in 1549 by Cristoforo da Messisbugo, cook and master of ceremonies at the Este court, the author describes in detail the stuffing technique for charcuterie, as well as the use of red wine to flavour the meat. Two centuries later, in 1722, a playful poem entitled La Salameide was published, a genuine tribute to the product, in which the author, Antonio Frizzi, creatively explains the etymology of the name Salama and honours its Ferrara origins. 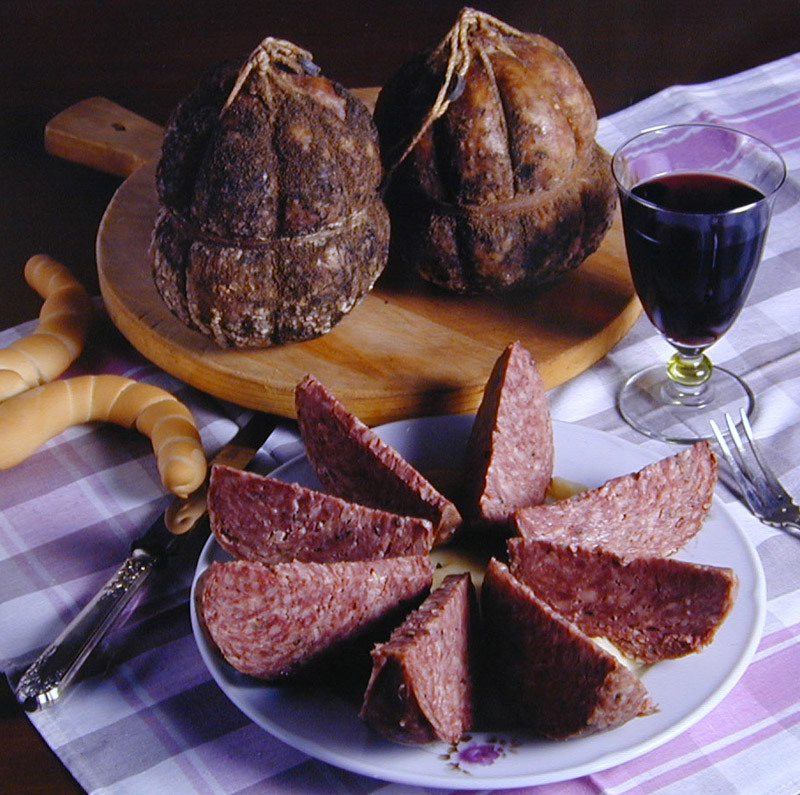 Salama da Sugo PGI is made from a mixture of seasoned pork cuts with a natural pig’s bladder casing. Subject to drying and curing, two types are produced: Cruda (raw) or Cotta (cooked) followed by heat treatment. Pigs destined to Salama da Sugo PGI are slaughtered at over 9 months old. Only selected meat cuts can be used, such as cheek, neck, bacon, shoulder, tongue and liver, in specified percentages and with the optional addition of minced meat from below the shoulder. The meat is seasoned in red wine that has been aged for less than 18 months and must be one of a short list mentioned in the specification. In addition to black pepper and coarse sea salt, an optional choice is using spices like cinnamon, nutmeg and cloves. The stuffing process is carried out manually to ensure the integrity of the bladder, which is then tied with twine. The product is then dried and left to cure. It appears in a round “melon” shape and is divided into 6/8 segments, with a constricting band around the middle. The outer surface is uneven and may have traces of mould that form naturally during the curing process. It has a firm and compact consistency. The aroma is intense and extremely spicy, with a full flavor accentuated by a spiciness that lingers on the palate; it has a soft and grainy texture. It must be eaten after cooking. Inside the Province of Ferrara, the villages mentioned in the specification are “championing” the primacy in quality of this product, boasting recipes that differ with each other for some details. The “rivalry” over the years has led these countries to try to increase the visibility of their product by bringing them to the national level. In 3 municipalities take place 3 different events, because everyone want to obtain each year more visibility on its own recipe. 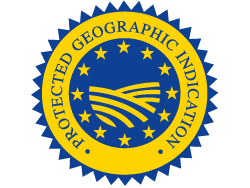 Protected Geographical Indication (PGI) recognized under Regulation EU Regulation 316 of 04.11.2014.